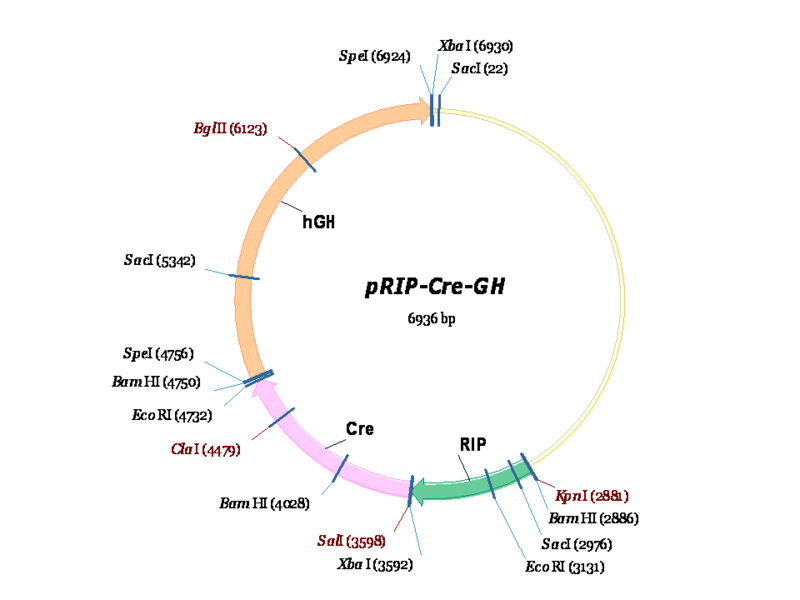 This plasmid contains an insulin-cre-hGH fusion gene that was made as follows. (1) The 1.2 kb NLSKOZCre gene from pmL78 was subcloned into pBSIIKS at Sal I and EcoRI. (2) The 0.7 kb rat insulin promoter 2 gene (RIP) was subcloned from pSPRIP into the Kpn I and Xho I sites. (3) The 2.1 kb growth hormone gene from pOGH was cut at BamHI and EcoRI, blunted, and Spe I sites introduced on either end; this GH gene fragment was then subcloned into the Spe I site of the clone from step 2. (4) A small Sal I/Sal I polylinker fragment between RIP and Cre was deleted. (5) The final construct (pBS/RIP-Cre-GH) was cut at Kpn I and Not I and used for microinjection. This plasmid was used to generate RIP(Ins2)-Cre transgenic mice.